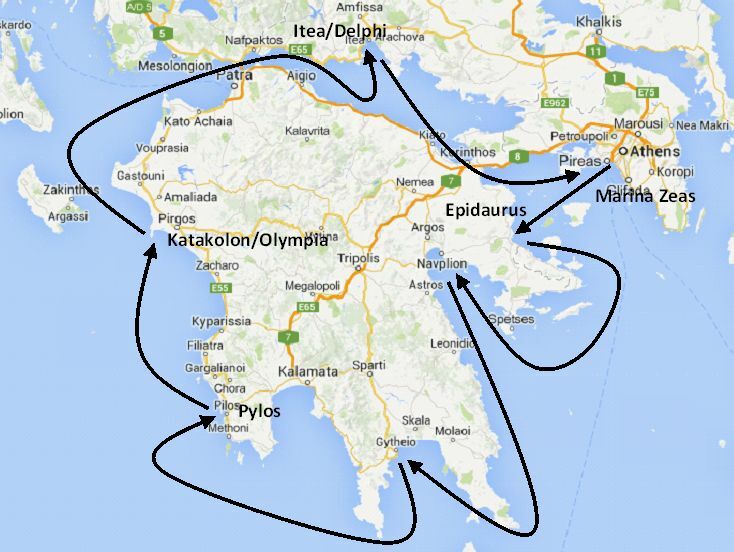 A cruise voyage unraveling the world famous Corinth Canal and the most important monuments and historic sites of Greece. 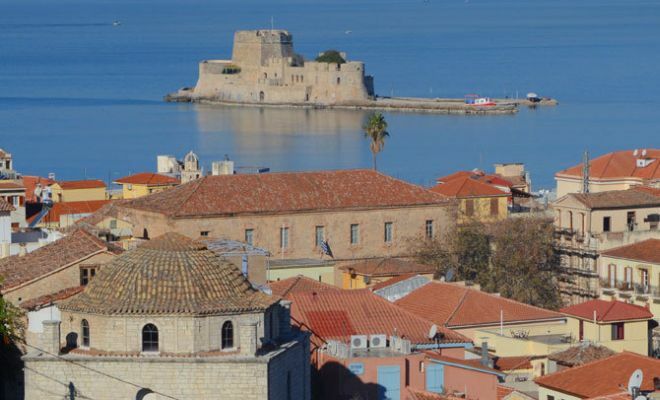 Experience a harmonious balance between conventional cruising and private yachting, along with an exciting voyage of discovery, unravelling the wonders of Antiquity and Byzantium around the coast of the Peloponnese. 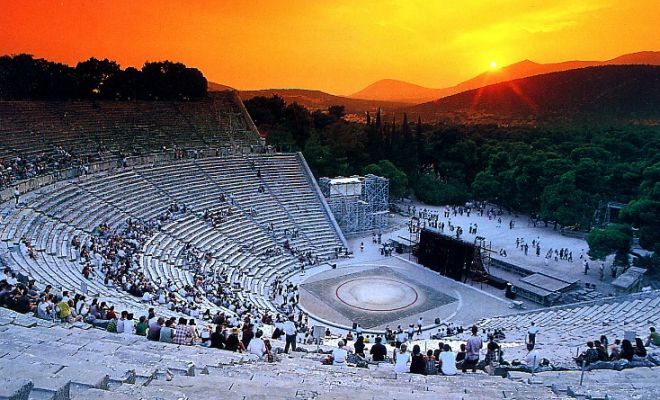 Each day you will discover a new port of call, a leap back into ancient history to amaze you and rich cultural diversity to intrigue you. The M/S Galileo, built with the most stringent safety regulations, was launched in 1992 and was fully rebuilt in 2007. 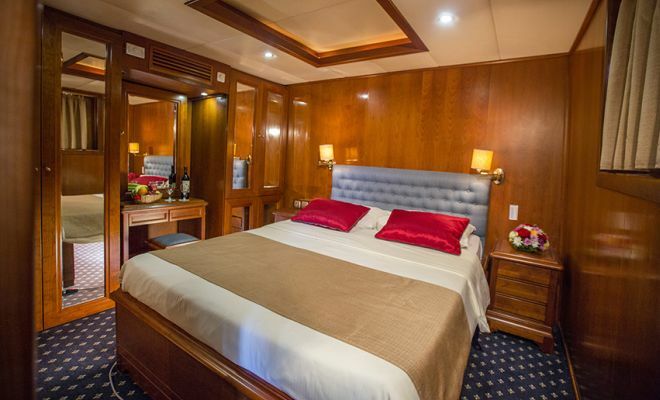 The latest renovation works of the M/S Galileo took place between November 2015- March 2016 and included significant upgrading of the guest accommodations as well as the indoor & outdoor public areas. 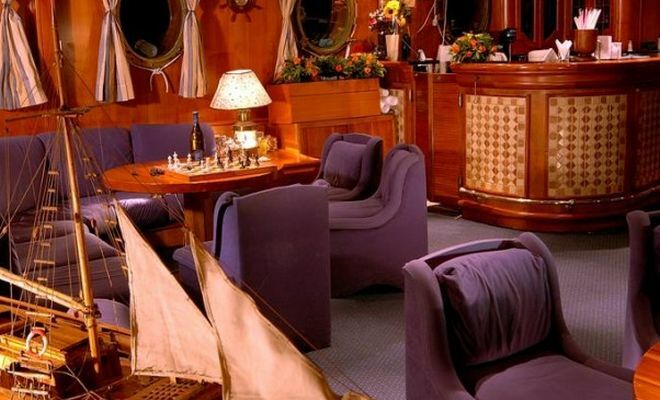 During the day, life on board centers around the indoor lounge area and dining room, as well as the outdoor areas at the Main, Upper and Sun decks. The Captain will drop anchor at secluded bays and beautiful uninhabited islands where , weather permitting, guests enjoy swimming, snorkeling, kayaking. Renovated in 2016, the main deck lounge area with an American bar leads into a warm and elegant dining room finished with wood and carpet flooring, and beautiful soft fabrics. The spacious dining room seats all passengers in a single, unassigned seating and allows for spectacular views around you, while dining in an elegant environment. Food is served at the table or displayed on the state of the art hot & cold buffet which also includes a “a la minute cooking” section. Guests on Galileo very much enjoy the shaded outdoor area with an outdoor bar where they can relax enjoying the most breathtaking sea views. The vessel features a Sun Deck with a sitting area to relax and enjoy unobstructed views and with ample Sun loungers’ space to sunbathe under the Mediterranean sun. In the evening you can watch the sunset, enjoy a drink overlooking the stars. 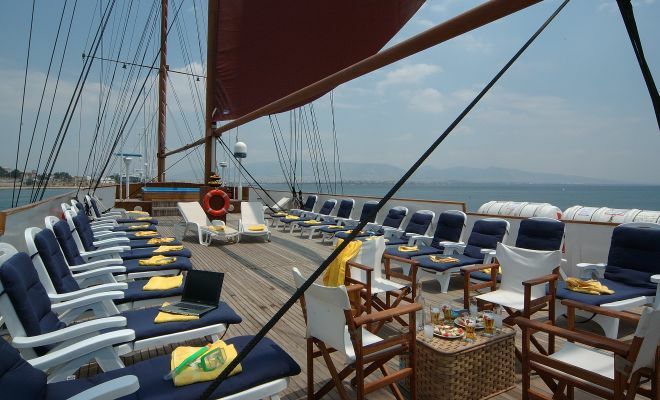 Guests on the Galileo enjoy the shaded outdoor Bar area at the Upper Deck as well as the Sun Deck. 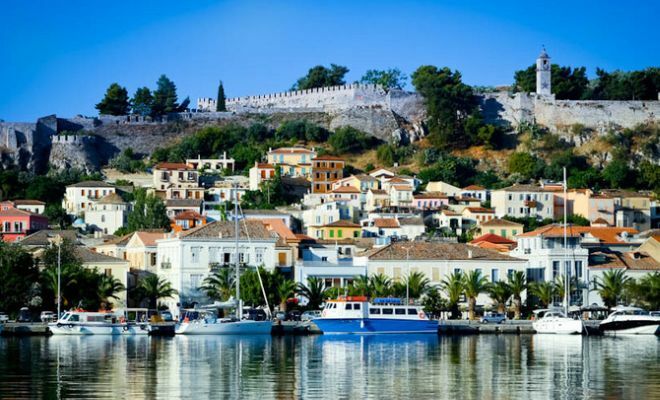 Pylos is a picture-perfect seaside town on the southwest corner of the Peloponnese. In 1827 a fleet of Venetians and other city states defeated an Ottoman fleet in one of the most important naval battles in history. 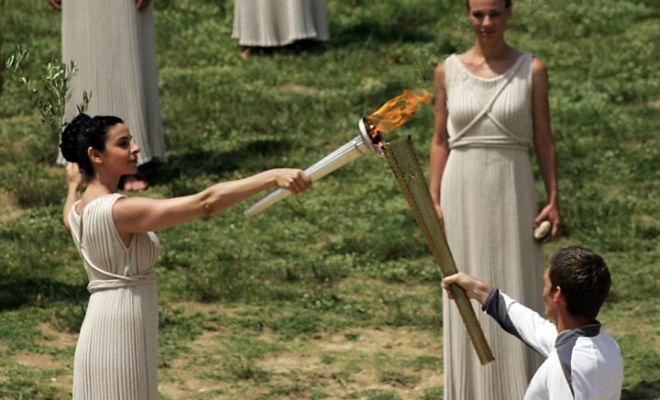 This defeat led to the independence of Greece, which occurred in 1829. 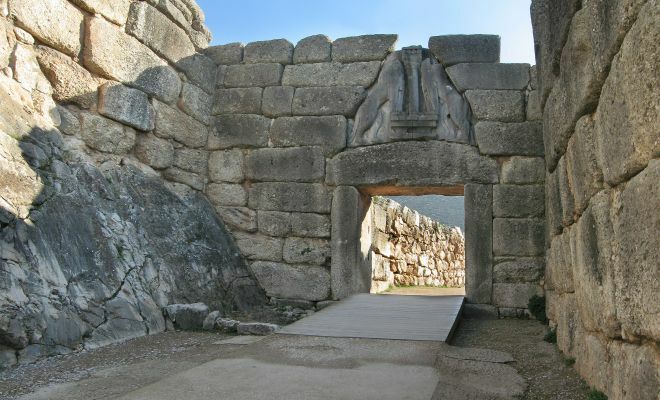 During our optional excursion and after stopping to admire the scenery, we will continue up the road to Nestor’s Palace. The remains of the prehistoric Palace occupy a scenic hilltop setting north of Pylos. The palace at Pylos belonged to Nestor and was discovered in 1939 by the American archaeologist Carl Blegen. Highlights include the well-preserved royal apartments and a bathtub that archaeologists have speculated belonged to the old king himself. The palace, with its central courtyard, was originally two stories high and richly decorated with frescoes. 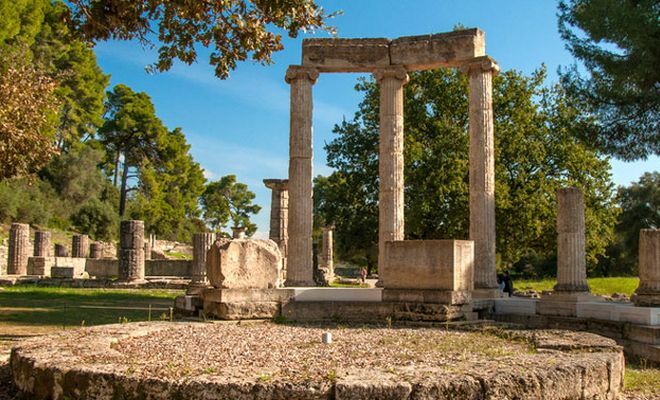 Following our visit to the remains of the palace, we will make the short trip to the town of Hora where a superb archaeological museum holds thousands of artifacts recovered from the site. Overnight sailing to Katakolon.